Last night I had the privilege of sitting in row J center orchestra for the brand new Broadway musical creation of the Cirque du Soleil theatrical group. 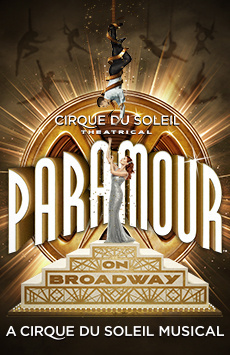 This show is called Cirque du Soleil Paramour, the company's first "made for Broadway" show. Paramour is a wonderful new musical that captures the era of the "Golden Age of Hollywood". Although only a 3 character show about a love triangle between a film director named A.J. that is about to finish his latest film creation and his love for the leading lady who goes by the name of Indigo. He may have his sights set on making her his bride but the young lady is in love with a young poet/songwriter named Joey. Will true love win over art? The role of A.J. is played by the very capable Broadway regular Jeremy Kushner ( Footloose, Rent, Jersey Boys, Jesus Christ Super Star), Indigo is played by an incredibly talented Ruby Lewis (Grease, Gypsy, Jersey Boys, We Will Rock You) and Joey is played by Ryan Vona. Mr. Vona appeared on Broadway in 2012 in the show Once. These 3 talented actors are terrific in their roles in Paramour, especially blending so well with the Cirque du Soleil juggler, trampoline artists and acrobats flying high over the stage. Although the story is an easy one to follow, the execution of Cirque's performers help to make this one of my favorite musicals to date. And I get to see most of the Broadway shows. Lucky me, right? Each side of the theatre has sizable video screens so that various moments can be captured no matter where one is sitting in the Lyric Theatre. The set design has been beautifully created by Jean Rabasse with sensational choreography and costume design by Daphne Mauger and Phillippe Guilottel. Cirque du Soleil pulls out everything in their imagination to help ensure that Paramour pleases at all times. You'll see what I mean when you see the show yourself for sure. Cirque du Soleil's new Broadway musical Paramour is a vibrant and exciting as the action takes place throughout the theater during several moments of the show. The audience enjoyed the cast and Cirque company members as they came close to them in their seats. Their applause was frequent and I could easily tell that they were thoroughly entertained all night long. Cirque du Soleil has managed to create the most unique entertainment in the world, combining theatre and the world of circus all beautifully interwoven within one show. It was founded by two street performers by the names of Gilles Stecroix and Guy Laliberte and the company is the largest entertainment company in the world right now. Although they are based in Montreal, Quebec, Canada- Cirque's shows mostly play to audiences in major cities around the country including Las Vegas, New York, Orlando, and the company does put on touring shows in several cities around the country as well. When the show ended the audience stood up and gave the cast a well deserved standing ovation. If you are thinking about seeing a show on Broadway one of these days do yourself a favor and buy Cirque du Soleil Paramour tickets in New York City. My company Applause-Tickets can be reached 24/7 to assist you in finding some very good seats and at reasonable prices. Thanks for reading my post on Cirque du Soleil Paramour in New York City, the entertainment capital of the world.